2,000 civilians died during 78 days of devastating NATO airstrikes on Yugoslavia in 1999, when citizens of a European country became accustomed to war-heads flying over their heads, hiding in bomb shelters and praying for their loved ones to stay alive. US President Bill Clinton calls the bombing “humanitarian intervention” adding “It is also important to America's national interest”. NATO aircraft take off from bases in Italy and Germany, the first of 1,000 sorties under operation ‘Noble Anvil’ (seriously). NATO launch Tomahawk missiles with 1,000-pound warheads from ships in the Mediterranean and Adriatic at military facilities in Pristina, Podgorica, Batajnica and an air base near Belgrade. For the first time Serbian night skies are lit by fire from a NATO explosion. At an emergency UNSC meeting only Russia, China and Namibia support a resolution condemning NATO’s aggression. NATO insists it will only bomb military targets in Yugoslavia, regularly issuing photos to support the claim. However, the so-called “humanitarian intervention” killed 2,000 civilians. 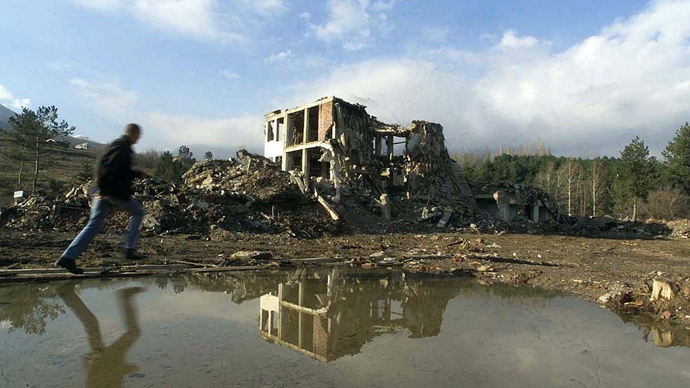 NATO destroyed homes and schools, libraries and hospitals, dismissing it as ‘collateral damage’. A target became protest symbol. 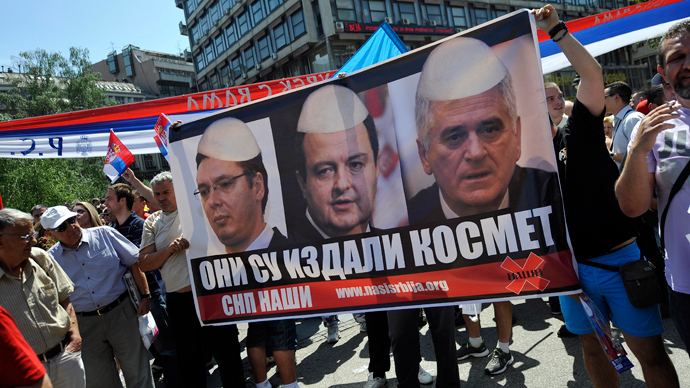 Anti-NATO demonstrators would use them in Belgrade and around the world. 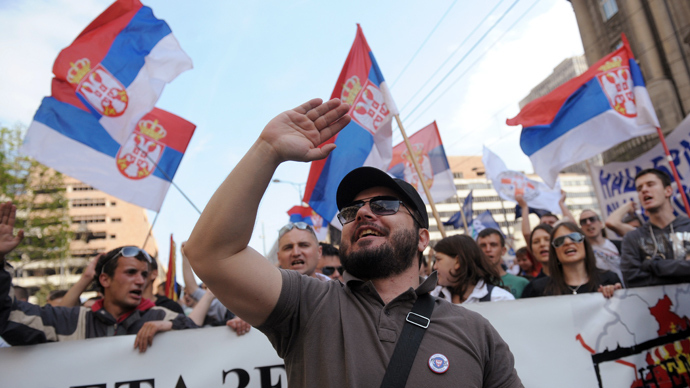 In April, Belgrade announced a unilateral ceasefire to mark the Orthodox Easter and made an offer to allow refugees to return to Kosovo. The West replied with another night of bombing. Thousands of people spent nights in bomb shelters. 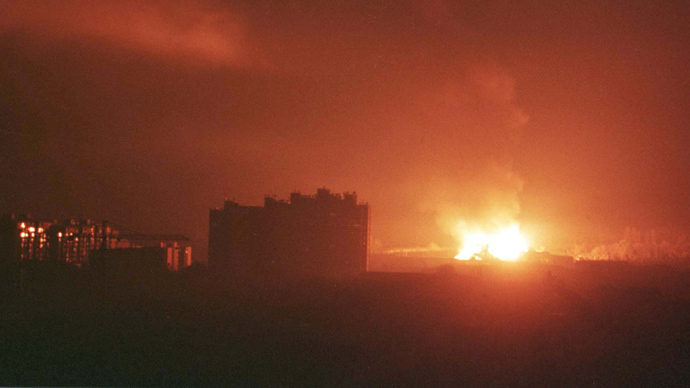 In late May NATO plunged Belgrade into darkness, destroying a power plant that supplied much of Serbia. NATO either completely destroyed or damaged 40,000 homes. Refineries and chemical plants all over Serbia were destroyed, polluting the region’s ecology and damaging public health. 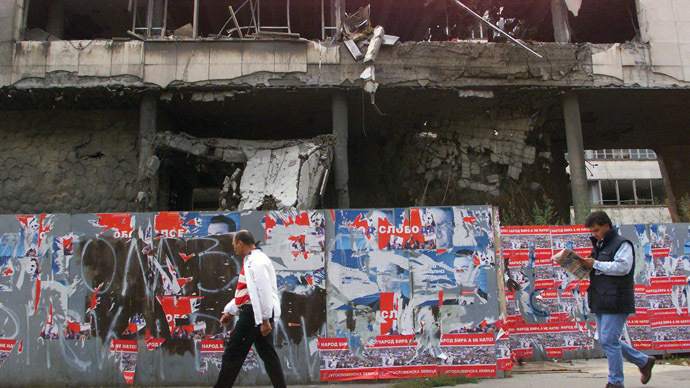 15 years after the NATO bombings, Serbia is still haunted by the memories of the aggression which cost it hundreds of lives.